This is a small satellite website built to help drive traffic to the main Basically Trade website, visually impactive and interactive the client was very happy. 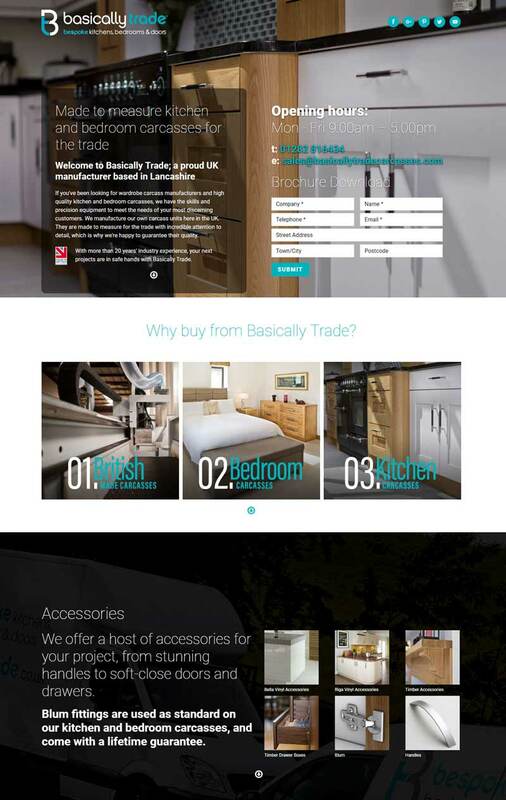 Basically Trade recently employed McKenzie Creative to develop a new satellite website. From our first brief through to the design, build and installation we found this company to be thoroughly professional in their technical approach with a clear perspective on the given brief and deadline, which all we’re achieved brilliantly. Therefore, we would have no hesitation in recommending McKenzie creative for any future projects. Website Design & Build, CMS System, Mobile Responsive. If you’ve been looking for wardrobe carcass manufacturers and high quality kitchen and bedroom carcasses, we have the skills and precision equipment to meet the needs of your most discerning customers. We manufacture our own carcass units here in the UK. They are made to measure for the trade with incredible attention to detail, which is why we’re happy to guarantee their quality. Made in Britain With more than 20 years’ industry experience, your next projects are in safe hands with Basically Trade. If you would like to talk about a new website or any design work please use either of the following.